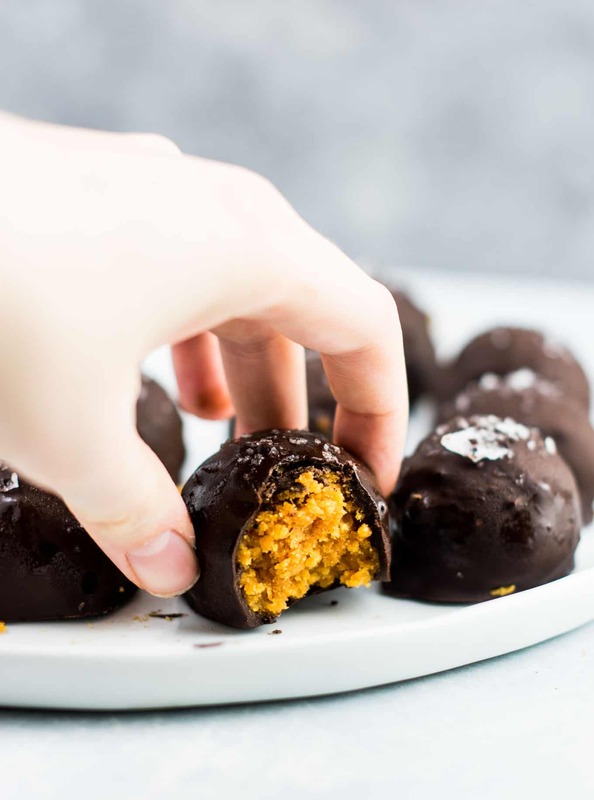 It’s pumpkin season and today I’m introducing you to the magic that is these Dark Chocolate Pumpkin Truffles! Sweet pumpkin spice filling coated in melted strong dark chocolate and topped off with flaked sea salt on top. Guys, if you love pumpkin you will go nuts for these delicious little bites! 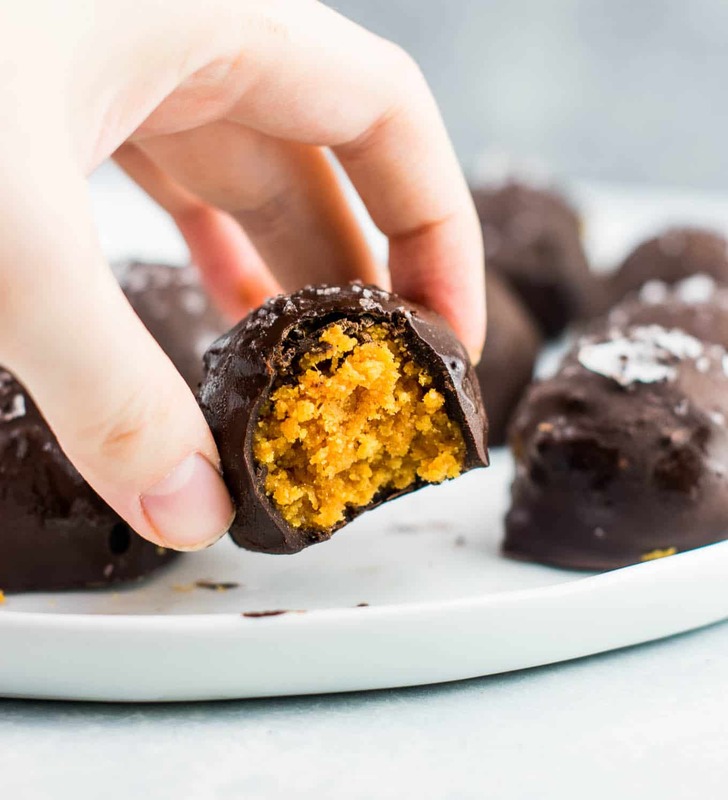 After I made peanut butter truffles last year, this year it inspired me to make these delicious pumpkin truffles. Truffles don’t have to look perfect to taste incredible! 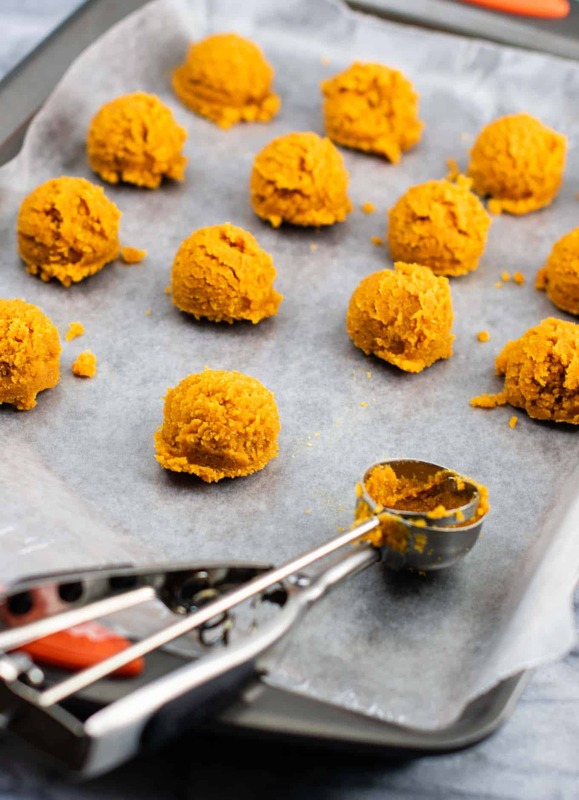 In a bowl, you will mix together all of the ingredients for the pumpkin truffles. You will need: canned pumpkin, coconut flour, maple syrup, vanilla, salt, pumpkin pie spice, cinnamon, sugar, and coconut oil. The batter will be nice and dense, and not sticky. I specifically made this recipe to use a whole can of pumpkin. That way you won’t have to worry about coming up with a use for leftover canned pumpkin, or wasting it! Plus, it makes more than 30 truffles so these are great to make for a party! 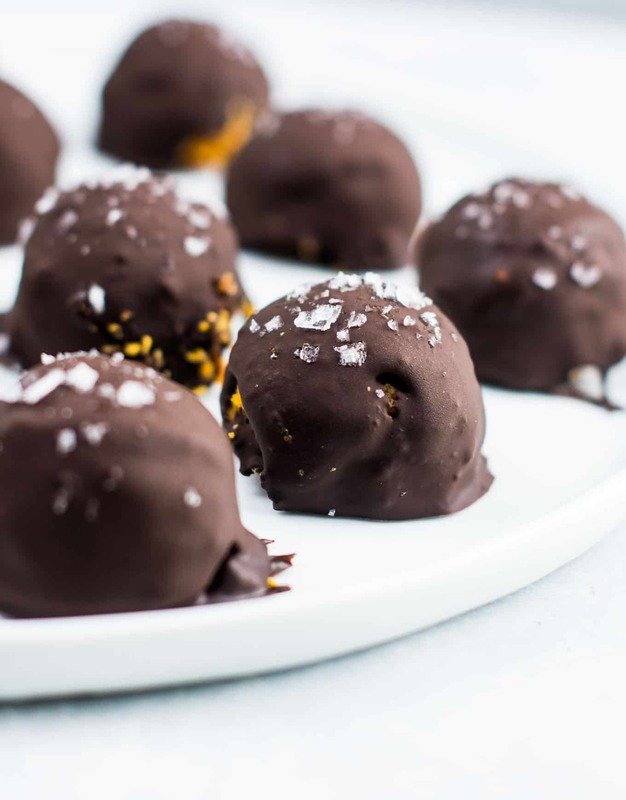 These truffles are also vegan, gluten free, and no bake. So easy and perfect for everyone to eat! My #1 hack for making these truffles super easy is a mini ice cream scoop, which is really called a cookie scoop technically. Just grab a cookie scoop, press the batter firmly into it, and drop onto a lined cookie sheet. This way is so much easier than using your hands, and cuts a lot of time off of the prep. Totally worth it to me! My cookie scoop is a well loved tool in my kitchen. 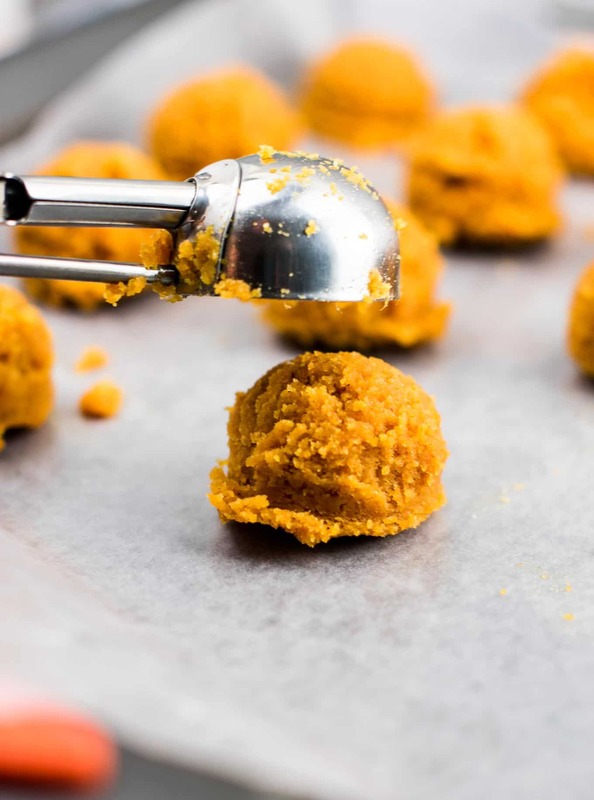 If you do not have a cookie scoop, simply use your hands to roll the batter into balls. Once you have scooped all of the truffles, place the cookie sheet in the freezer for 20 minutes. Cold truffles make for easier dipping, and less batter getting into the chocolate. While the truffles are chilling, melt your chocolate. You will need 3 1/2 cups of dark chocolate chips. I used 69% cacao which is pretty rich dark chocolate. The filling is very sweet, so the rich slightly bitter chocolate is the perfect flavor contrast! 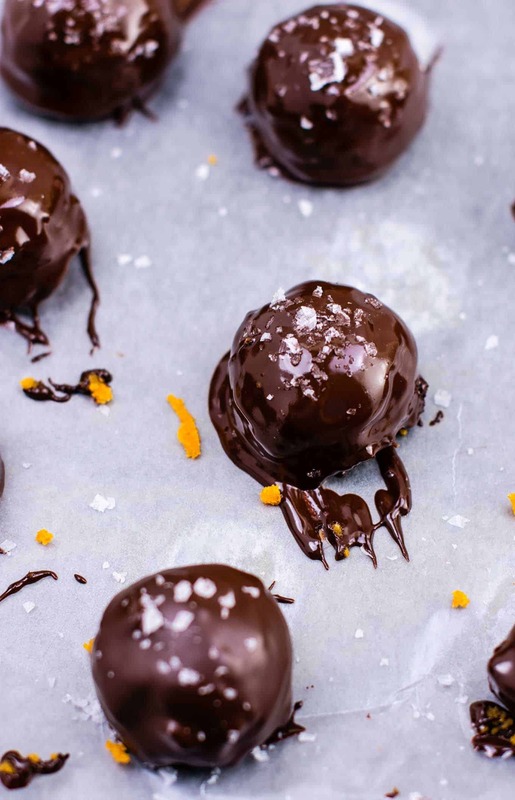 Once the truffles are chilled, it’s time to coat them in the chocolate. For each truffle, drop it into the bowl of melted chocolate. Use a spoon to drizzle chocolate over the top, then quickly remove with a fork and toothpick. I usually google a truffle tutorial online before making them just as a quick refresher! After each truffle is dipped, place it back onto the wax paper lined cookie sheet. Sprinkle immediately with flaked sea salt. This is important to do this after each truffle, as the chocolate hardens quickly. If you wait until the chocolate is hardened to add the flaked sea salt, it will not stick to the top and will fall off. The sea salt is key for the perfect bite so don’t skip it! Sea salt flakes on chocolate are LIFE CHANGING. Just try vegan chocolate sea salt pretzel bark or almond butter cups if you need any more convincing! My vegan pumpkin chocolate chip cookies also are topped with sea salt and they are incredible! It really takes the flavor to the next level. Love no bake desserts? 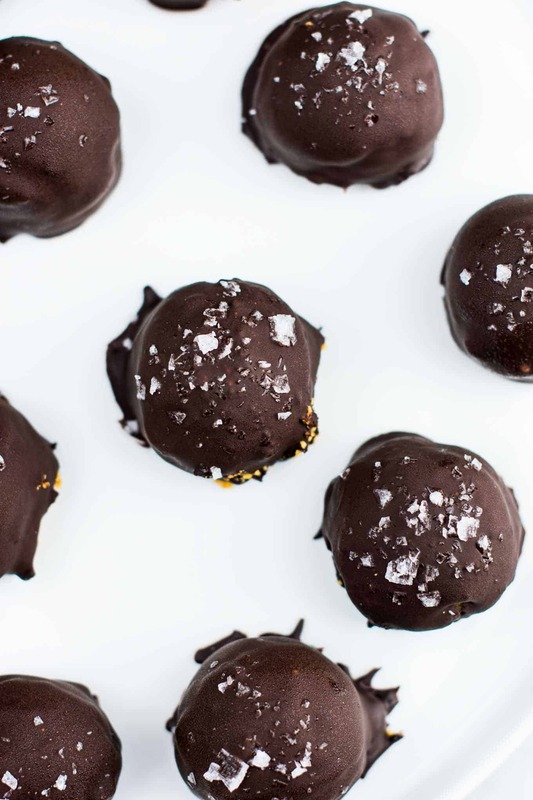 These truffles were inspired by our healthy no bake peanut butter truffles. 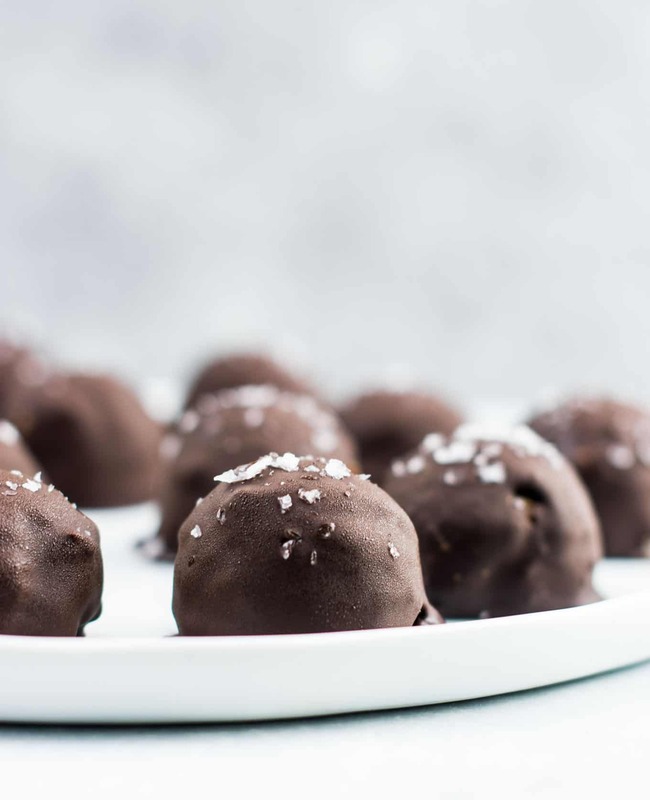 Try making truffles at home and let me know how they turn out! Here are a few of our other favorite no bake desserts! 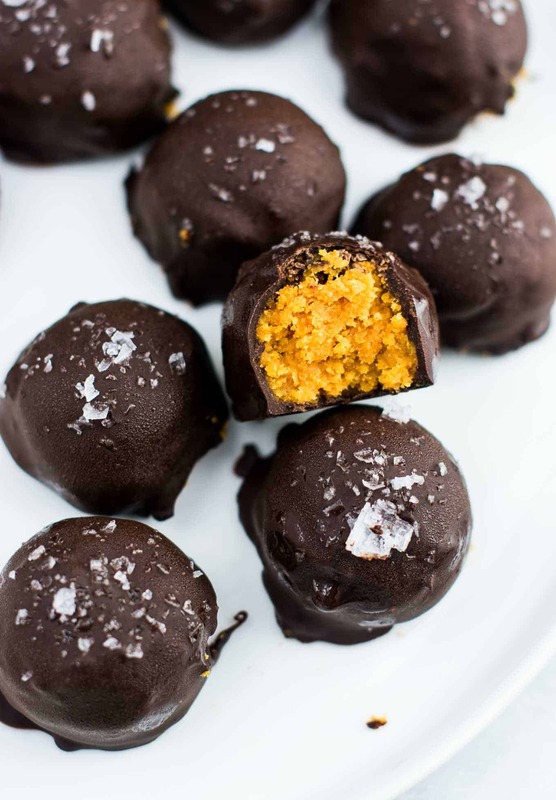 You have to try these pumpkin truffles! Don’t forget to tag us on instagram @buildyourbite and hashtag #buildyourbite with your recipe photos! We can’t wait to hear what you think of these delicious pumpkin treats. Looking for more delicious and easy pumpkin recipes for fall? Here are some of our favorite pumpkin recipes! Want to save this recipe and more? Be sure to follow us on Pinterest! 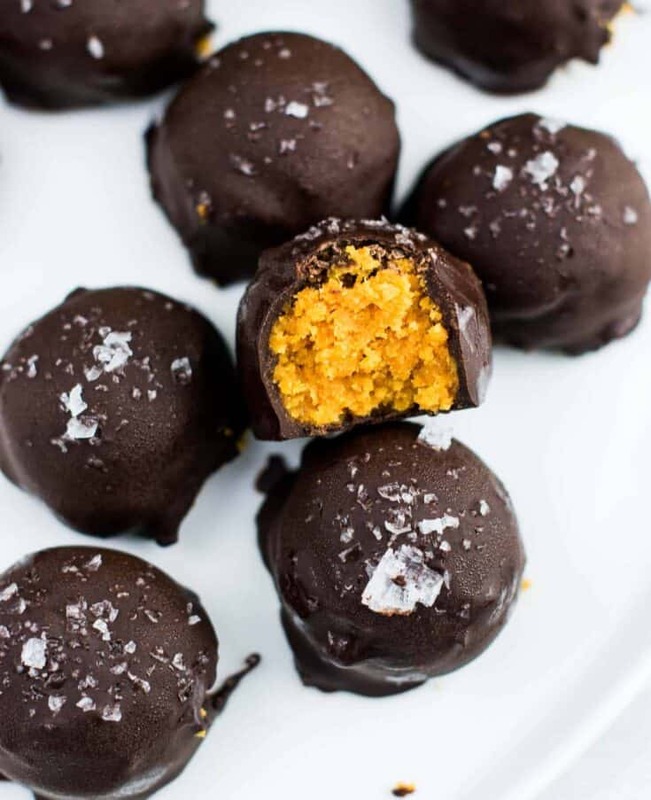 Click HERE to pin this pumpkin truffle recipe for later! If you purchase through a link, I get a small commission, at no additional cost to you. Add pumpkin, maple syrup, vanilla, pumpkin pie spice, salt, cinnamon, sugar, and coconut oil to a bowl and mix well. You can easily google "how to dip truffles" to find a visual tutorial if you have never made them before! Do you think if I omitt the 1/2 sugar that the sweetness of the chocolate chips would be enough. Or should I add a sweetener? I would personally add the sweetener as the dark chocolate chips are bitter in taste. If you use milk chocolate they would be sweeter. These look amazing!!! Do you think i can form the balls with my hands rather with an ice cream scoop? I mean is the batter non-sticky enough to be managed with hands? And also i want to add only coconut sugar instead of the agave and cane sugar, do you think it will work this way? Thanks and love the pictures! So I made them and I gotta tell you these are my favourite truffles ever! I can’t even tell you how many I ate I kinda feel guilty. I am so glad you enjoyed the recipe!! Thanks so much for sharing your review 🙂 I ate more than I will admit too, haha!